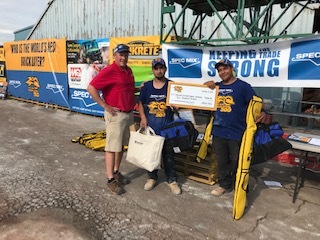 Manassas – The 2018 SPEC MIX BRICKLAYER 500® Virginia Regional Series has come to a close and mason James Currier and mason tender Alexis Aquino of Top Notch Brick and Block in Norfolk, VA won it all. This is the second straight regional win for Currier, and now he and his tender head to Las Vegas to compete in the SPEC MIX BRICKLAYER 500 World Championship next January at the World of Concrete. Glen-Gery Brick Center in Manassas, VA hosted the regional series event, one of 24 being held across North America. The qualifying national competitors will battle for a chance to win over $125,000 in cash and prizes, including a Ford F250 XLT 4X4 truck and John Deere Gator. 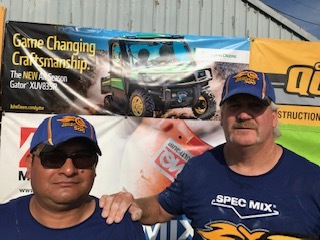 SPEC MIX TOP CRAFTSMAN which goes to the team with the “most sellable wall,” went to mason Bonilla Hernendez and mason tender Samual Cuchilla of Telligent in Rockville, MD. The masonry team also took 3rd place with a brick count of 400. 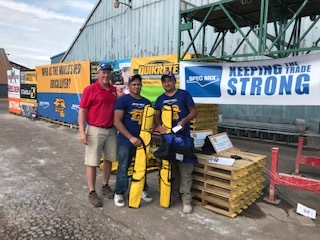 2nd place went to mason Marlon Rodriguez and his mason tender Edwin Velasquez of Alban Masonry in Washington, DC with a brick count of 458, nearly missing the winning mark by two bricks. There was a great crowd this year, with an estimated 130 people on hand to support masonry. Distributors and national sponsors were also on site to join in on the fun and to demonstrate their products.